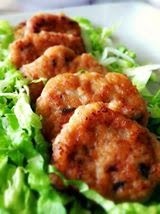 1 pack (200g+) of minced pork or beef or chicken or mix. Mix all ingredients in a mix bowl, stirring in one direction till it become sticky. use a spoon to scoop out a dollop and pan fry it. taste it and adjust the seasoning accordingly. 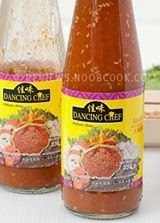 Suki sauce:pour half bottle of dancing chef suki sauce in a mini pot on medium heat. put in 2 Tbsp minced garlic / 3 Tbsp finely chopped spring onion + corriander / 2 Tbsp sugar. Stir and cook for few minutes. Done! to serve ~ sprinkle with some grounded peanut and spring onion.